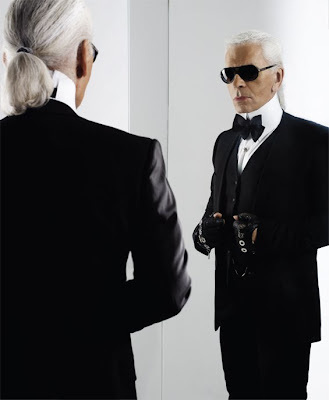 On the 22nd of September 2008, an interview with Karl Lagerfeld appeared in the French ELLE. The focus of the interview were the facts presented by Alicia Drake in her book entitled Beautiful People. According to Lagerfeld, there were several, hm, misleading facts on which he gives his opinion in the interview. Later on, A. Drake replied to what Lagerfeld had to say. I'm not interested in whatever the issues with this book are. What I liked were some general statements in Lagerfeld's answers, which allow me to create a more accurate vision about his person. What his main thinking guides are and how he pictures the world around him. Let's allow ourselves a short glimpse. He was born to be different. As he says it, you couldn't doubt the fact even for a second... Karl Lagerfeld is one of the most iconic characters in the fashion world. A titan, right next to Yves Saint Laurent. He has done so many different and bold things, and he continues doing them, without the fear of time passing by so quickly. I think I already went babbling about Lagerfeld on this blog too many times, but I can't help coming back again and again. I love it when people like him are lacking any sense of modesty whatsoever and go straight up saying they are worldwide known stars. I mean, why not say it if it's true? He allows himself any kind of craziness because when your this eccentric you can do things like putting your face on bags. Controversial photo that was, not so long time ago, but even back then I totally understood this gesture. Another thing to admire about him is saying he does not enjoy any experiences that keep him out of his natural state of being. Luxury means being lucid. Maybe he says this because it's one of the hardest things to achieve, isn't it? Resist any temptations... He tears himself away from anything that doesn't do him good. Suddenly, just like you would do with a piece of paper. Oh, how amazingly liberating! And it does require quite some power and determination to do it. I like the fact that he believes in himself, but I disagree with him not recognizing religion. It's such a difficult subject to approach on any basis anyway. Fun fact about him is that nobody can tell for sure his exact date of birth... Some say it's the 10th of September 1933 (Wikipedia), but the year is actually unknown. Hah. Lagerfeld does not think that much about posterity. Paradise is now! Oh yes, mister L.